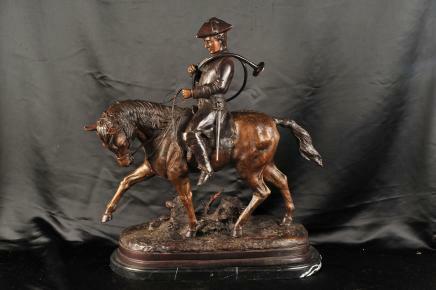 You are viewing an impressive bronze casting depciting an French huntsman on his horse. The huntsman has on a traditional hat and is holding a bugle in his right hand. 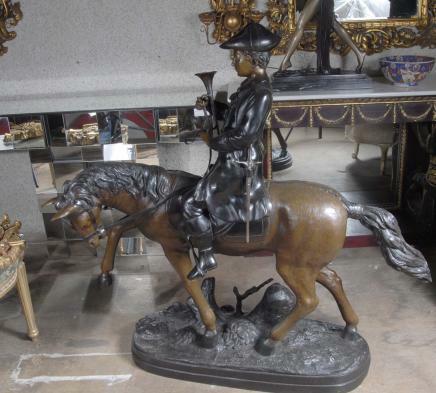 He is probably a turn of the century (18th) fox hunter and would make for an unusual decorative piece for your home. He sits astride his horse which is depicted in a cantour. The artist has really caught the horse with great skill – especially when you look at details like the musceltone and proportions. The ground is also very detailed with branches and tree stumps. The patina to the bronze is a mix between dark brown and a lighter brown and this is offered in perfect condition ready for home use right away. The making of bronzes is a complicated process and this can lead to the high cost of some bronzes but it is something to be appreciated and as an item will retain its value. The entire process of making a bronze can take anywhere from six weeks to four months to produce a single piece. Being bronze it will last forever without rusting and in this way increase in value over time and hence are a great investment or heirloom. Bronze is any of several alloys consisting mainly of copper and tin. Neither ancient nor modern bronzes consist only of these two metals. Zinc, lead, and silver were added to bronze alloys by Greek and Roman founders for use in tools, weapons, coins, and objects of art. Zinc, lead, and other metals are occasionally present in modern bronze.